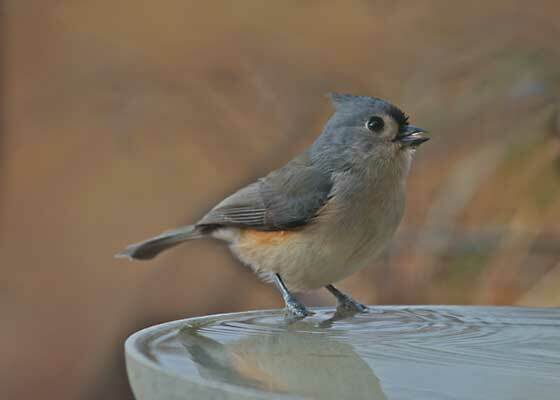 When the tufted titmouse stops by for a drink, it's really "only for a second," and zip, the bird is gone. 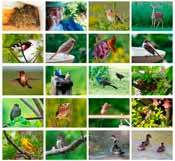 But it's a fine moment for me, seeing the bright-faced high-energy titmouse up close. 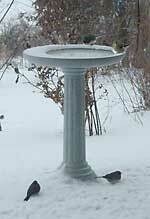 Our favorite winter bird bath, the Kozy Bird Spa, is great all year around and in all climates. The heating element is built into the bowl. The cord plugs in from inside the pedestal. Read Diane's review.